I think it’s safe to say that people around me have always had an interest in henna. From third grade’s passing trend of dotting yourself with brown washable markers to the stands at Texas A&M’s AggieCon and International Week, the intricate, spiraling patterns of dried Lawsonia have been a source of fascination to many for years. 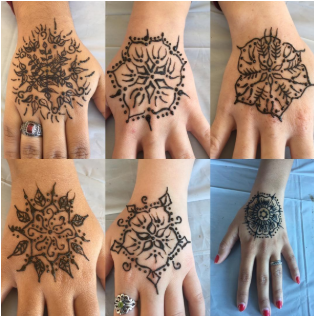 Riya Santra, the International Student Association’s VP of Marketing, served as co-chair of last year’s I-Henna fundraiser, just one part of International Week, which is a week-long showcase of cultural diversity at Texas A&M. In her opinion, it’s art like henna that can work as a teaching tool or as a way to span cultural divides. Kriti (pronounced KRI-THEE) Gaur is a senior bioenvironmental science major from Plano, Texas, a supplemental instructor, I-Henna volunteer, and the seeming best friend of at least half the BCS area. For her, as someone with both a strong interest in visual arts and a great pride in her Indian heritage, henna has been a source of fun and relaxation, as well as a way to express her creativity and culture. K: I first became interested in henna as a hobby when I was a little girl of 4 years. I’d been seeing the women in my family do it during summer vacations in India, around the time I started to take a strong interest in drawing. Fast-forward 15 years, and I’m a freshman in college. I was at a cultural gathering involving a lot of Indian people, and some of the girls there were doing henna. There was a large number of people at this event and it was somewhat difficult for everyone to get henna done for them, so I stepped in to help! I ended up having a really nice time and spent a good portion of the evening doing henna for people. Later on, I started doing henna for some of the girls in my dormitory. With the amount of time and intricacy of each henna design, I decided to turn my hobby into a small side hustle to earn a little extra money. I started charging for my henna tattoos in September 2016 and since then I’ve been doing a lot of art for lots of unique people in the BCS area! S: So how does this normally work? Do people come to you with design ideas or do you tend to play around with patterns or images for your clients? And then where do you go from there? K: I usually do my best work in henna whenever I freehand, and when I am doing that, I kind of just go with whatever pops into my head. I like to experiment with a lot of patterns, sometimes I do mandalas. I try to stick with multiple motifs that I combine together. Or, I just start with a small design and keep expanding outward. I enjoy planning as I go along, and the end result is always very randomized but rewarding. Often, customers will come to me with ideas they have for a particular design that they like, and I do my best to fulfill the request. I do have my limitations, but most of the time, I am able to follow through with my requests. Some of the best commissions I’ve done actually did come from customer requests, and although they usually are more time consuming, the final product is something I’m usually very proud of. An example of a commission that someone requested…I once had a lady who wanted a henna of full angel wings on her back. The entire process took 4 hours and I consider it to be the very best commission I’ve ever done. S: On a related note, psychologist Carl Jung was pretty into the concept of mandalas throughout his career (I’d picture Michael Fassbender for a mental image of Carl). According to Jung, the mandala is a graphical representation of the self, a kind of metaphor for movement towards self-knowledge. Do you find a kind of relaxing or meditative aspect in your work? Your “zen” to quote an Uber driver I had? K: So I do henna occasionally so that I can relax. It is very meditational and provides a calming effect, not just because of the essential oils infused in the henna, but because I find it very easy to get lost in a design.Letting loose with my creativity is usually the perfect thing I need after a very long day, and henna provides the perfect way to do it. S: Is there anything you’d like to say to anyone maybe considering picking up henna as a hobby or to any beginners out there? K: Picking up henna takes a lot of practice, so get as much as you can! I used to practice with old henna cones that I got from the Indian store, and sometimes just used the henna cones to doodle designs on old sheets of paper. A lot of it is about technique, and knowing just how thick to make your lines, which comes through practice. It seems a bit difficult to do, but if you have a knack for drawing and are able to do it with finesse, delicate movements, henna may be a good fit for you. Make sure your henna does not dry out, and I’d definitely recommend making your own if you can, because organic henna is better for the skin and more environmentally friendly. Henna takes a lot of patience to do, but the more you do it, the more you get the hang of it. The possibilities are endless, and the creativity that comes from it is limitless. S: Lastly, what do you think people in the BCS area like about henna? Riya Santra: Those we have met in the BCS community are always awed by the intricacies of the design and respectful of the cultural significance behind it. From observing those who come to our fundraisers and talk to the artists or other customers, I truly believe that it is a great way to spark conversation and create a space for people to share stories of their experiences or learn something new! Kriti: I think what people in the BCS area like about henna is the fact that it’s quite unlike anything they’ve ever seen before. Indian culture isn’t very prevalent in this area, so most people don’t know very much about henna. But the customers I’ve met who are familiar with the process are always very intrigued with every design that I make. I’ve found that it’s relatively easy to get other people interested, even if they’d never heard of henna before. It’s a novel art form and is something new to experience for everyone because you don’t always know what you’re going to get. Most of the feedback has been positive from people in the BCS area, and I’ve received such a wonderful amount of support. I even got to do henna at AggieCon 2017, which was when I had the most customers ever! Generally, I try to make it a rule to never deny a guest, even the most ridiculous request. I try to make it clear that the process of how I make my henna is very safe, and I use the finest ingredients and take great care in making my organic henna. I want to expose more people to the culture and beauty behind the entire process–so that those who get to experience it, whether they’re a first-time customer or a regular, to relax and enjoy themselves. I’m glad you enjoy it! So far we are posting every Tuesday.